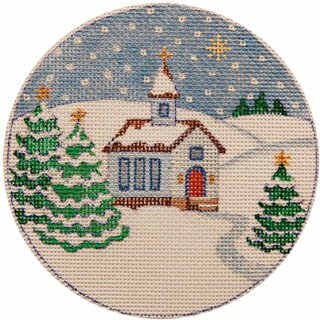 This Christmas Needlepoint ornament called Country Church is handpainted onto 18 mesh mono canvas. It is by JulieMar & Friends. This design measures 4.5" in diameter. You can order the canvas alone or with threads. If you select threads we will send DMC cotton floss or Planet Earth Pepper pot silks. If you choose Mixed threads we will send mostly silk with some Kreinik glitter, wool and cotton for a festive ornament. Make your selection from the drop down menu. If you want to hold the canvas taut we recommend a pair of 9" stretcher bars and some thumb tacks. This canvas usually ships within one week. If you are concerned about shipment contact us with any questions. We are happy to respond.